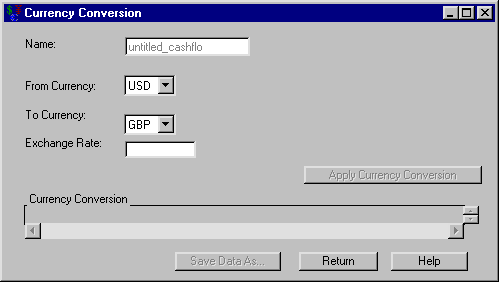 Having selected a generic cashflow from the Investment Analysis dialog box, to perform a currency conversion, select Compute Currency Conversion from the Investment Analysis dialog box’s menu bar. This opens the Currency Conversion dialog box displayed in Figure 57.9. Name holds the name of the investment to which you are applying the currency conversion. From Currency holds the name of the currency the cashflow currently represents. To Currency holds the name of the currency to which you wish to convert. Exchange Rate holds the rate of exchange between the From Currency and the To Currency. Apply Currency Conversion becomes available when you fill Exchange Rate. Clicking Apply Currency Conversion fills the Currency Conversion area. Date is a SAS date within the cashflow. The From Currency value is the amount in the original currency at that date. The To Currency value is the amount in the new currency at that date. Print becomes available when you fill the Currency Conversion area. Clicking it sends the contents of the conversion table to the SAS session print device. Save Data As becomes available when you fill the Currency Conversion area. Clicking it opens the Save Output Dataset dialog box where you can save the conversion table (or portions thereof) as a SAS Dataset. Return returns you to the Investment Analysis dialog box.